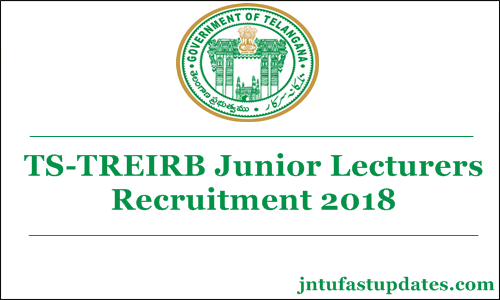 TREIB Junior Lectures Notification 2018 Application Form Online at www.treirb.org : Telangana State Government has released the Gurukulam Junior Lecturer Notification for 281 posts. Telangana Residential Educational Institutions Recruitment Board (TREIB) or TS Gurukulam is going to start the application process from 9th August. Interested and eligible aspirants can apply for Telangana Gurukulam Junior Lecturer posts can apply before the last date 8th September 2018. Aspirants waiting for Telangana Gurukulam Lecturer notification 2018 can check all the details once from the official notification and proceed to apply through TREIB Official website, treirb.telangana.gov.in. For the reference of aspirants here we have attached the official notification PDF at the end of the article. Telangana Residential Educational Institutions Recruitment Board (TREIB) or TS Gurukulam is the state level educational organization that offers the jobs in residential schools and colleges. Annually the TREIB department announces various teacher/lecturer notifications to hire the suitable aspirants into various posts. The TS Gurukulam has announced the Junior Lecturer notification on 31st July. As per the notification, the announced posts are 281. Aspirants seeking to get Jr. Lecturer posts in Gurukulam colleges of Telangana can proceed to apply for the TS Gurukulam Jr. Lecturer Posts. Aspirants seeking to apply for TS Gurukulam Jr. Lecturer posts must have the educational qualification of Post Graduate Degree (or its equivalent) with at least 50% of marks. Age limit of the applicants must be in between 18 years to 44 years. Candidates belong to the reservation category will get the age relaxation as per the norms. Candidates interested to know more details such application process, complete eligibility criteria, important dates, selection process, pay scale and other details from the following. Applicants must have the necessary educational qualification of a post Graduate Degree in the subject concerned (or its equivalent) (Table-I) with at least 50% marks in aggregate from a University recognized by the UGC. In case of SC/ST/BC/ Differently abled candidates, the minimum marks shall be 45%. Age limit of the applicants must be in between 18 years to 44 years. Candidates belong to the reservation category will get the age relaxation as per the norms. Shortlisted candidates will get a good pay scale of Rs.35,120- Rs.87,130. Interested and eligible aspirants can proceed to apply from 9th August. The TS Gurukulam Jr. Lecturer online application will be accessible on its official portal, treirb.telangana.gov.in. Suitable candidates can hurry up to apply for TS Gurukulam lecturer posts on or before 8th September 2018. Can we apply without B.Ed ..